How can you create a more memorable Christmas this year? Prepare, surprise and be intent on creating a joyful day. 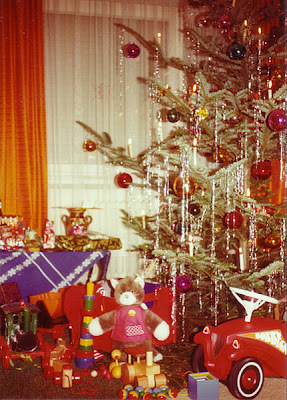 Christmas morning, the kids would gather in the living room for the tree lighting. Kids’ emotion? Excitement! Tip: Sing a carol to remind everyone that Christmas is all about birth of Jesus. Follow it up with the opening of presents. Kids' emotion? Joy! The most meaningful gift in my memory is my first bicycle.Tip: Put thought into your gift-giving this year to give presents that are meaningful and memorable. Gift giving always was followed by my family gathering around the table. Tip: After the gifts are opened, head off to breakfast and/or Christmas dinner (featuring kids' favorite foods) with a sweet dessert. Splurge a little—it's Christmas, after all! In Growing Green Two Ways!, my reflections of a Pacific Northwest childhood, I offer up other Christmas traditions, which leads to my final tip: Surprise someone by ordering and giving this “Wow!” book for Christmas. Available at Amazon.com by clicking here. Photo source: Wikimedia. Photo in the public domain.